Abstract: The US plutocracy (evil corporations and their evil sponsors in the US government) fed the criminal German war machine in World War One… And then pulled the plug, a strategy which made the US flourish, while, and because, Europe deperished… However the German spirit of Armageddon was preserved, deliberately, to organize the Nazi Party and nazi spirituality, immediately after. That was accomplished first, by not pursuing the German war criminals. As plutocracy is back to its dirty tricks with Brexit, it’s high time to look at history with some more blazing realism. So this essay talk of the Kaiser and his racist, maximally vicious goons, but one should keep in the back of one’s mind that this is also about the fact the Kaiser was the grandson of the “Empress of India”, Queen Victoria. In other words, this is essay is ancestral to that British elite which fostered Brexit, the deliberate alienation from a pacified Europe, thanks to having hypnotized the gullible with a pack of lies, similarly to hypnotizing the German population in 1914 to attack the world in general, and democracy in particular. The Netherlands and the USA became wealthy from helping the Kaiser and his criminals-against-humanity attack civilization in 1914-1917. Those German criminals, and their spirit of unpunished criminality against humanity had more to give (Nazism). Thus the US was going to do its utmost not to hang them… Just as the French Republic was not to receive the guarantees she needed, to ensure the Germans fascists were not back to their criminality against humanity within a few years (as it turned out they were). German Foreign Minister Von Ribbentrop was condemned to hang at the Nuremberg trial in 1946. The charge? War of aggression. Reasoning superficially, the Nazis had accused France and Britain to have started World War Two. Hitler pursued that line to his last evil breath. Indeed, France and Britain declared war to the Nazis: they sent Hitler, strong from his alliance with Stalin, Hirohito and Mussolini, a 48 hours ultimatum within a few hours of Hitler’s attack on Poland, September 1, 1939. However the Nuremberg tribunal viewed the nazi claim that France and britain had attacked, for what it was: sheer, cowardly idiocy: ever since they came to power the Nazis had worked towards war, and that got hot in 1936, when they invaded Spain, bringing the downfall of that Republic with three year war which killed millions (reference: the Guernica painting). August 1, 1914, had been much worse: that day, out of the blue, Germany declared war to Russia (Russia had not attacked Germany, nor planned to; Russia was mobilizing, true, but that was supposed to take weeks; whereas German mobilization could be done, and was done, in 5 days, or so). The next day, August 2, mounted German cavalry had penetrated deep inside French territory, killing and getting killed. These were the first dead of WWI. The French were taken by complete surprise: WWI was on. When the Americans woke up, they realized that the dumb, brutish evil that was Germany would come to their shores, should it conquer Europe… However, the US plutocrats’ thought processes were more subtle than that… Where lesser minds viewed a terror, they viewed an opportunity…After the war, French authorities had determined that at least 1,000 German war criminals should be arrested, and face capital charges. Some of the charges were for example the deliberate killing of a two-year old little girl, who was bathing, one of many assassination which was fully documented… Still, nothing happened: the Kaiser had taken refuge in the Netherlands, a country which, by being a conduit to US plutocrats, crucially helped extend the war of civilization against barbarity, by a 2 or 3 years. The Kaiser was not surrendered to the Allies because he and many fellow war criminals, had taken refuge in the Netherlands. The short of it: the Netherlands and the USA created enormous wealth for themselves by enabling the racist fascist plutocracy known as the Kaiser’s Second German Reich to fight World War One by evading the Franco-British blockade. US goods were shipped in gigantic quantities to Germany. Either directly or through the “neutral” Netherlands. 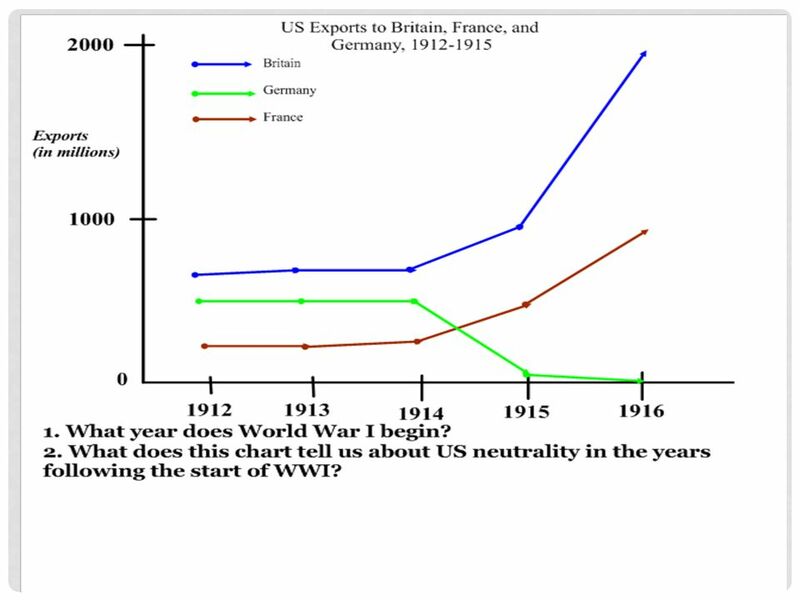 Exports of the USA to “Near Neutrals” surrounding Germany and Austria saw an increase of +20% in 1914, versus 1913, and doubled from 1913 to 1915, and again largely increased in 1916. These facts show that US goods were reaching the central fascist powers by way of “Near Neutrals”. This happened with the Netherlands, Norway, Denmark Sweden. Actually the collapse of the direct trade with Kaiserreich and Austria was more than compensated, in cash volume with US exports to the “Near Neutrals”. A more refined analysis show that the goods sent to Germany enabled that fascist racist empire to go on with its war of aggression against the democracies. In green, the collapse of trade of the USA with Germany, due to the maritime blockade imposed by the UK and France. The red line represents the rise of trade of the USA. I consulted older books and tables which showed the rise of the trade of the USA with the “Near Neutrals”. It’s roughly identical to (but less than) the graph the trade of the USA with France. Thus it more than compensated then the collapse of the direct trade with Germany. This red line thus represents contraband US help to the criminal regime in Germany. Over the First World War, the number of millionaires in the Netherlands tripled. From war profiteering. While the USA became the world’s wealthiest empire. The legalistic and uncivilized reasoning the USA used was to claim that “neutrality” implied keeping on trading as if nothing happened. Actually, something had happened in Germany, and it would be called “Nazism”, and rule, 19 years later. France and Britain protested as much as they could to Washington, that US trade was keeping the bloody invading Reich alive… to no avail. Around three million Allied soldiers died fighting for civilization against the fascist invaders, while US plutocrats and their employees back home in the good old USA, made like the bandits they were. Bandits and racists. Remember: these were the USA where the Civil Rights of the same people most Germans tended to view as subhuman were systematically violated. Nevertheless the Franco-British Navy was by far the largest and most powerful in the world: Germany and Austria-Hungary were progressively squeezed (after a while, the Royal Navy would stop US ships going to the Netherlands, and buy their entire cargo…) Trade of the USA with England and France more than tripled between 1914 and 1916, while trade with Germany was cut by over ninety percent. For most of the war the United States remained formally neutral. When it eventually intervened significantly, engaging two divisions in July 1918 (which were obliterated quickly), the costs it had to bear were tiny when measured against its huge resources and the colossal profits it derived from the war. America’s main competitors in the world free market, Britain, Germany and France, were busy slaughtering each other. opening world trade to the transatlantic colossus. Between 1914 and 1917, American industrial production increased 32 percent and US GDP increased by 20 percent. All this was encouraged by generous grants of the US government to businesses (aka plutocrats). Thus they got entangled. The Bank JP Morgan financed Britain, and then France… At interest, of course. In the end, in 1918, the US had changed sides, and the Franco-British blockade of Germany became very effective. Thus German explosive production collapsed to 5% of the French explosive production, which enabled the French to crush the last German offensives like bugs… The French had access to cotton, fat, etc… Let alone food, which Germany was running out of. Germany was so much out of fat, from the blockade, Kadaververwertungsanstalt (literally “Carcass-Utilization Factory“), also sometimes called the “German Corpse-Rendering Works” or “Tallow Factory” became a delicious piece of propaganda. It was supposed to be a special installation operated by the Germans in which, because fats were so scarce in Germany due to the Franco-British naval blockade, German battlefield corpses were rendered down for fat, which was then used to manufacture nitroglycerine, candles, lubricants, etc. Well, a variant of this kind of “rendering” of human flesh would happen for real, two decades later, in the bowels of Nazi Germany. Magnificent madman, butcher of Europe. 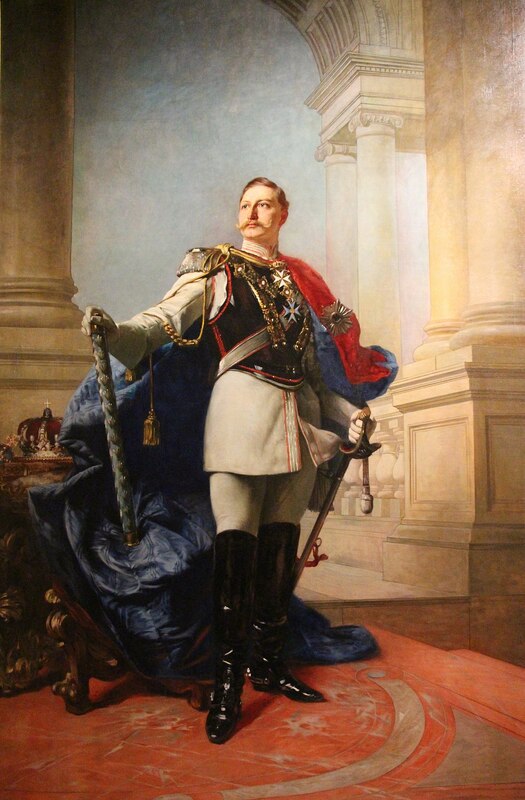 Official painting by Max Koner of the crazed grandson of queen Victoria, Kaiser Wilhelm II. The USA knew, because of the Venezuelan attempt by the Kaiser to invade it, that the Kaiser was nuts. However, the US Deep State decided to use it as a way to weaken France and Britain, and all of Europe. Whether the plot was conscious or not is philosophically fascinating. To claim that a cascade of alliances forced a scared Germany into war, the traditional story, is an horrendously inaccurate pro-fascist disinformation: it is actually Nazi propaganda. Germany had not been attacked in July 1914. Germany was not threatened. France did not do anything. France was invaded, without even a war declaration. Had the bigoted, racist fascist German invaders, aggressors and criminals against humanity, the Kaiser and his cohorts, who had planned war december 11 1912 been tried and executed, the top 1,000 of them… Nazism would NOT have happened: it would have been deprived of too many crucial leaders. The absence of punishment for the German war crimes of World War One taught the Nazis they could get away with war of aggression and crimes against humanity.. 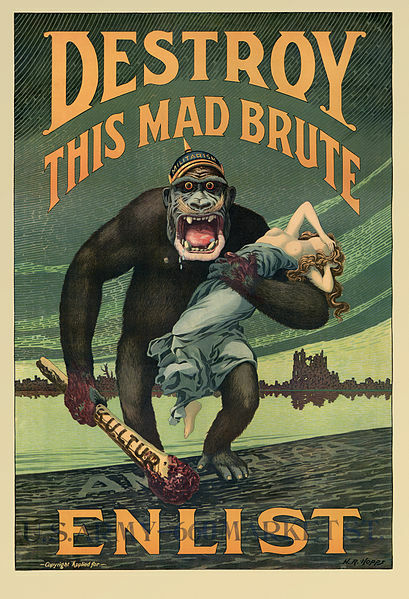 Considering the collapse of the German ammunition making capability, once the US lifeline to fascist Germany was cut off, it is clear that Germany would have had to capitulate within a year or so of its aggression on August 1, 1914, if the USA had not broken the Franco-British blockade. (August 1 is the day the Kaiser and his goons declared war to Russia; they invaded France within 24 hours, and declared war to France a day after, on August 3). So why was the nefarious role that the Netherlands and the USA played in World War One buried? Because, ladies and gentlemen, you are well immersed in the New World Order the heavy maneuvering of the USA started in 1914 contributed so much to. So you better love it, and not suspect it, otherwise you would be bad Americans! Why was the USA so nice and tender with the German war criminals of World War One? Germany was racist and exterminationist (see what it did in Namibia). The USA was racist, and had been exterminationist: a meeting of the minds. Actually, President Wilson and his right hand man, Colonel House, were notorious racists, and the latter proposed a racist world alliance to the Kaiser, June 1, 1914 (in the name of the former). According to me, that played a larger role than the Sarajevo assassination in deciding the Kaiser and his goons to launch a world war. Launching Germany at the US parents, France and Britain, was sure to destroy Europe, and would enable the US to come to the rescue of victory, as happened. At any point, the USA had the power to pull the plug on Germany, as it did in Spring 1917, by letting the Franco-British blockade be. In 1919, the USA’s deepest influencers, most of the US plutocrats, didn’t want Germany to become civilized; it still had to make to them the gift of Nazism… So it was important not to condemn the men who would make Nazism possible: most of these men were already in leadership positions in 1918. They kept those positions. For example, the chief of the general staff in 1918, Marshall Von Hindenburg, became president, and made Hitler Chancellor in January 1933. To predict the future it is necessary to know the past, as the past put in place mental, if not institutional structures which rule present dynamics. One such psychological structure from the past steering the future, is to carefully not understand what really happened, to please our masters, or our guilty consciousness, or our laziness, and to not make the effort to find out what Machiavellian plots were really at works, moved by which actors…. The descendants of such actors, physical or moral, are among us, and they are actually leading the show. They have no interest in us understanding what really happened, because it informs the world we can see disintegrating around us. To say it very clearly: today’s plutocratic order was forged in the dynamics of World War One, and its aftermath. The USA’s Deep State psychology, all too much the psychology of its plutocracy, has, mostly ruled, or majorly influenced, ever since. Peace, like violence, and for the same reason, going the other way, is paradoxical, self-contradictory. The Vatican just defrocked a US cardinal. Not only the cardinal was stripped of his cardinality a few months ago, but now he is not even a priest anymore. I think he should be excommunicated, too. For crimes against children. If we, civilization, want to survive, we have to become perfect. Socrates said an unexamined life was not worth living. I say: an unexamined subconscious is not worth having, if survival is the primary objective. Note 2: The usual “Marxist” and “Neoliberal” analysis of World War One are much closer to each other than to my own analysis, which should be termed “Democratic”. Both “Marxist” and “Neoliberals” historians pretty much attribute WWI to an accident between great imperialist powers: Europe was a powder keg ready to explode. However, in Europe, only fascist Germany and the French Republic had enormous forces which could be deployed in a few days. And, but for few Belgian forces quickly swept away, World War One was, for a few weeks exclusively a massive assault of nearly the entire army of fascist Germany against a surprised French Republic. Thus, contrarily to the official fake version of history, the evidence instead is that the fascist racist plutocracy ruling Germany decided to risk everything, by physically destroying France, as it viewed itself ultimately condemned by the rise of democratic France and increasingly democratizing Russia, while unable to catch up with the Royal Navy of the democratic UK (which had the resources of the British empire). So, for me, the difference is the democratic index (that can be calculated, I will have to explain some day). The German attack on the world was decided by 6 men (2 of whom, the navy men, being reluctant) . To compare, Earl Grey went to the UK Parliament… So basically 600 men, for very good reason, gave the UK foreign minister the green light to declare war to the attacking Kaiserreich. One could say the UK was at least 100 times more democratic than Germany (600/6 = 100…)… all the more as the MPs got elected…. This entry was posted on February 21, 2019 at 8:15 am and is filed under Germany, Systems Of Mind, Trade, War. You can follow any responses to this entry through the RSS 2.0 feed. You can skip to the end and leave a response. Pinging is currently not allowed. So Americans instead of accusing Trump of treason all day long should consider their own history? No surprise here. Plutocracy does not prosecute its war criminals. US corporate establishment supports perpetual war. Anyone who challenges this disappears from the media. Tulsi Gabbard is being smeared by the media for being anti-war right now. Tulsi a congresswoman from Hawaii who is running for president of USA. She is espousing an end to regime change wars such as in Iraq, Syria, etc. – the press are smearing her regularly. Regime change wars can be good: this is why the French Republic declared war to Hitler (the UK was forced to tag along…). Regime change in Iraq, the way it happened was very bad. This said, Saddam didn’t help his case. Regime change in Syria could have worked, early on… Or then one could have made an offer to Assad he couldn’t refuse. Examples right now are Pakistan (which should be pushed HARD towards not causing trouble in India anymore; Pakistan supposedly is trying to make the Taliban change, towards peace, so the US is in a weird position…) North Korea (negotiate with Kim, while carrying a big stick and a giant carrot). Or Saudi Arabia (try to make MBS sane). Or Venezuela (Maduro has got to go). Regime change wars to grab the resources from another sovereign nation – Venezuela’s oil- are not justified even if he is a “bad guy” etc. US is OK with lots of “bad guys” unless the bad guy won’t play ball to let US corporate oligarchs exploit the bad guy’s people. Agreed that war to grab resources are, at first sight, bad. However, whatever Maduro has been saying, he and his goons have grabbed the resources. Venezuelan oil started to collapse under Chavez. Potentially, Venezuela could have the world’s largest oil production. Instead it’s going to zero. 13%, at least of the population has fled. I know personally a 25 year old engineer and his brother who fled. Living in Spain now. Maduro is, definitively, a bad guy. Look on the bright side, we have avoided any wars between major European powers since 1945. Even India and Pakistan have avoided war since 1971. The US now only bombs countries that are too poor to have air defenses. Since 1948, there are structural ties between France and Germany, so a war between them would be a civil war. Much more so since (police right of pursuit, etc.) French and German legislations are now the same, etc…. Same right of nationality, etc. RE Venezuela, US wants to accomplish a coup to let fossil fuel corporations seize its oil reserves. Whether or not Maduro is a “bad guy”, the world is full of them and US ignores them unless they have resources to exploit. Just look at Libya and Iraq. But when the bad guys play nice with US, different story. Just look at how US is not looking to topple the Saudis who are clearly bad guys- instead US gives them a free pass to spread terror. Maduro himself has made a coup! I know Venezuelan engineering students, they are livid, no food, no jobs, terror by goons working for Maduro, they are trying to make it in Spain! 15% of the population fled! venezuelan oil production is collapsing, it’s 5% of what it could be! Even French oil company Total (not a friend of the USA!!!!!!!!) had to flee! Toppling Saudis would be disastrous for Europe first… USA don’t care. Wall Street would delighted to see FRACKING become profitable, after ten years of losses… But Europe? What would they do without MBS and Putin? Very difficult to get good info on Venezuela but find hard to believe the US (CIA, DoD) to be acting in the interests of the people of that country when Bolton has already declared publicly that he sees intervention as a means for US oil companies to exploit the reserves. Typical US tactic that rarely plays out well for the people of the South America. Bolton is trying to seduce his own Plutos with his belly dance. The EU is against Maduro too, it’s not just the USA. 3.5 million refugees and counting. The Venezuelans I know are not counted as refugees, BTW, but they are (they would prefer to be back in Venezuela, and have their families free of hunger…) The US was long agnostic about Venezuela, as Venezuelan oil was going to the East Coast. All the people who brought us the current mess in the Middle East by invading Iraq are still respected members of the US establishment. John Bolton is working in the White House. Elliot Abrams is back from the Iran-Contra scandal. Absolutely. And this happens precisely because there is no desire for studying history in a highly critical way. Could the Athenian democracy have handled the twin Spartan and Persian threats and aggressions differently? Could France have gotten rid of Louis XIV or Napoleon, before they became two legged atrocities maniacally obsessed by vainglory, greed, and the darkest evil? Could Rome have done without calling onto Tiberius to reign? Could Marcus Aurelius have launched a revolution back to the Republic? What would have happen if the Western empire army of Arbogast have defeated the Goths and their promoter, the arch-Catholic Theodosius I? I was always left, but I have seen, for like ever, “left” people doing self-suggestion, and embracing the likes of Castro, Mao, etc… Now Castro had excuses (US hostility)… But Mao much less so (consider Deng Hsiao Ping)…. Famous Univision journalist Ramos was detained for asking bad questions to Maduro! Under Chavez Venezuelan oil production went down. Under Maduro it collapsed by 2/3 (from the last year of Chavez)…. Detestable or not Maduro was democratically and legitimately elected by Venezuelans. This Guaido is a pluto puppet and never elected as president, so since when is it acceptable for foreign meddlers to install a president? Just more pluto nastiness at work. BTW fossil fuel is not a long term strategy with climate collapse. Look, I have never been to Venezuela. I know very young Venezuelans, who fled, with 15% of the country. They say Maduro cheated. Reliable media say he cheated. 50+ nations said he cheated. Really, I have seen that situation before, so many times: a horrendous regime, claiming to be left, exerting a rule of terror. Maduro doesn’t exactly exert a rule of terror, but the fact that the electricity conked is due to lack of maintenance, not Trump. Un-maintained forest burned the transmission lines. This is why they can’t get the electricity restarted. I f left people support the likes of Maduro, they lose all remaining credibility supporting the likes of Lula… Yeah, Lula corrupt too, but very little, and good for country in many ways… Maduro? I long said the USA will do a bait and switch on fossil fuels: push them until chaos and war ensues, then outlaw them worldwide…. Juicy wars in perspective… But Venezuela is collapsing now, 10,000 people could be dead in a week…. So let’s just recognize an un-elected US pluto darling as an interim president because we say so. Meanwhile Maduro was elected by a majority of voters, unlike the US president. Not buying any for a “coup” given US track record in South America and anywhere that has oil, etc. US “meddling” (CIA nastiness, sanctions, etc.) is typically a disaster for the populace. US plutos have no regard or preference for democracy as they have readily backed “cooperative” dictators, even the dreadful Saudi regime if it means oil profits. So even if Maduro is a “bad guy”, the real concern is that he is not US’s bad guy to do its bidding. BTW are not fossil fuels a major problem anyway?